I’ve got 2 things to show you today, first is a scarf for my grandmother in Seattle. She called Sunday night and asked for a scarf. I had some grandiose ideas about making Muir for her, but then reality set in. It’s winter, she needs a warm scarf now. I bought yarn Tuesday afternoon and after knitting exclusively for 2 days all the yarn is gone and Grandma has a nice new scarf going out in the mail tomorrow. The yarn is Plymouth Boku (blatant Noro knock-off) and the pattern is my own. I’ve seen so many great K1P1 Noro striped scarves out there, I wanted to make one of my own. I saw these 3 related colorways at the LYS and decided to do a scarf of three stripes instead of the 2 stripe ones that seem so prevelant. With 3 yarns you only work one row with each color before switching, which made to color repeats last longer. I was very pleased with the result. With 37 stitches on US sz. 8 / 5mm needles it ended up being 7 inches wide and about 70 inches long. Pattern: Umm… none. I thought this would be the High Neck Cable, but it is not. It is the: Steeked Shawl Collar Seamless Saddle Shoulder Pullover with Cables someone please give me a better name for this thing! Needles and Gauge: US sz. 7 / 4.5 mm are you serious, I was supposed to check gauge?! I don’t even know how to blog about this sweater! I didn’t take enough pictures to do justice to the processes this sweater went through. I knit the entire High Neck Cable up to the buttonbands, tried it on and hated it. 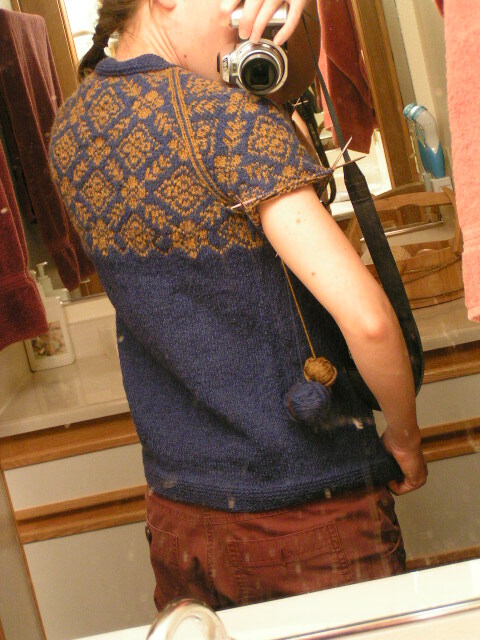 So I ripped out most of the yoke and knit a modified Saddle Shoulder crewneck. I tried that on too and hated it. Then I ripped it all the way down to the sleeve join – including unKitchenering the armpits – and tried again. 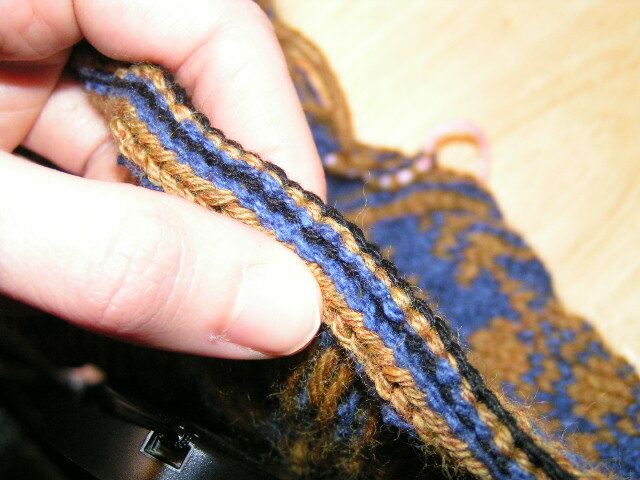 I dropped down 2 purl stitches between each cable and hooked them back up in knit to create ribs. 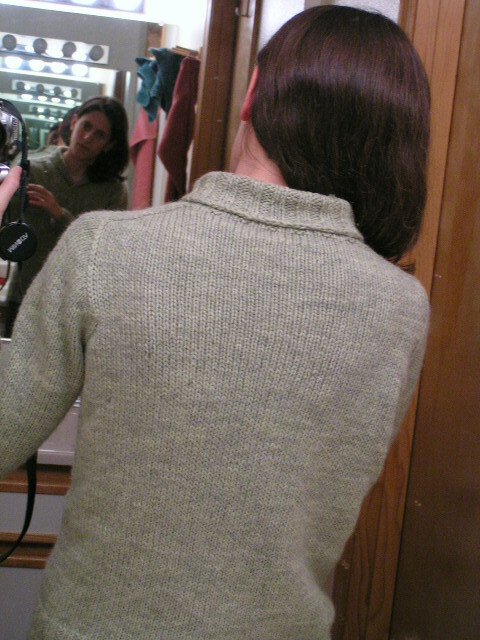 Then I used a somewhat modified Saddle Shoulder shaping for the yoke. At the spot that seemed appropriate I bound-off the 10 center stitches for the base of the shawl collar, cast on 5 for a steek and facing, and started a V-neck shaping. 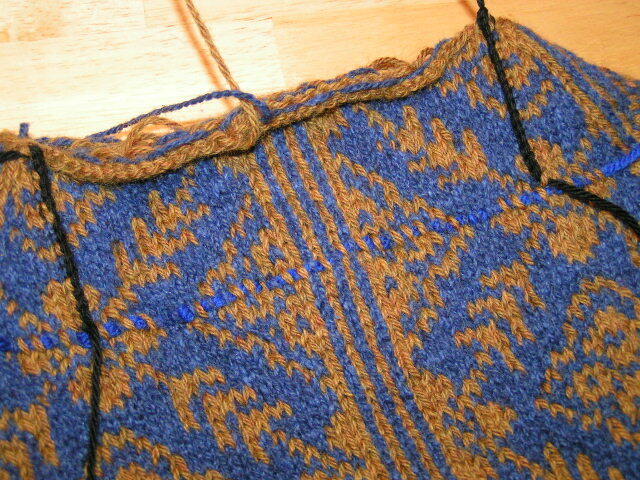 I continued decreasing (no back and forth saddles) until the steek neck stitches met the shoulder stitches. 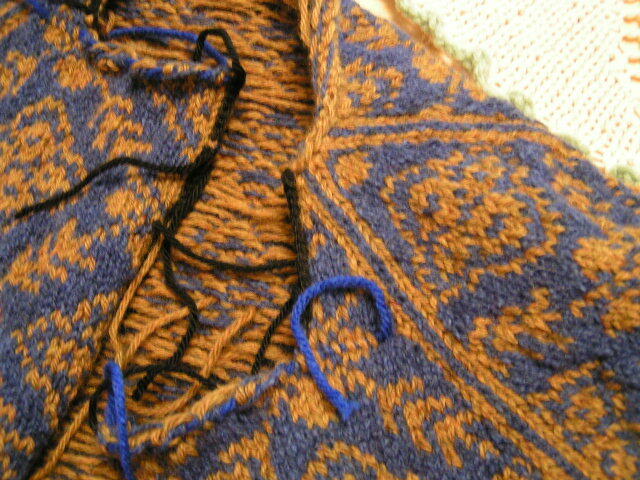 I then cast off the steek stitches and placed the others on a piece of wool. 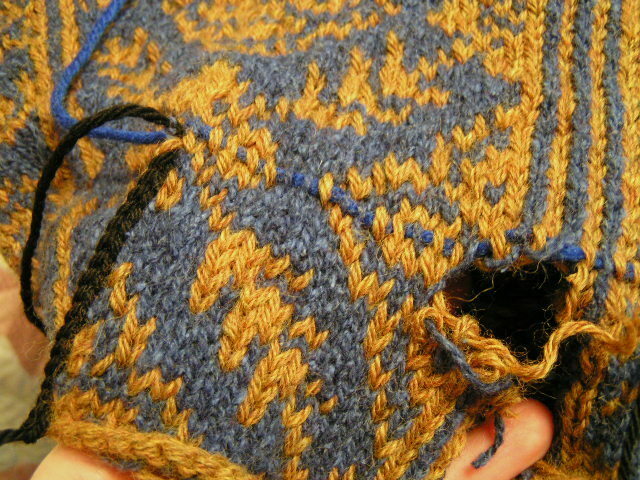 The steek: I didn’t take any pictures, but this is similar to what I did with the Adventure Sweater in July. I tightly crocheted 2 lines of slip stitches on each half of the neck. One line on the outside edge where I wanted to fabric to fold under, and one line close to the center to fold under the raw wool ends. This was the first time I have not machine reinforced a steek. It was rather exciting. Shawl Collar: After cutting the steek I picked up stitches along the (nice, tidy) edge at the rate of 2:3, then all the back and shoulder stiches from the waste wool, and on down the other neck edge. 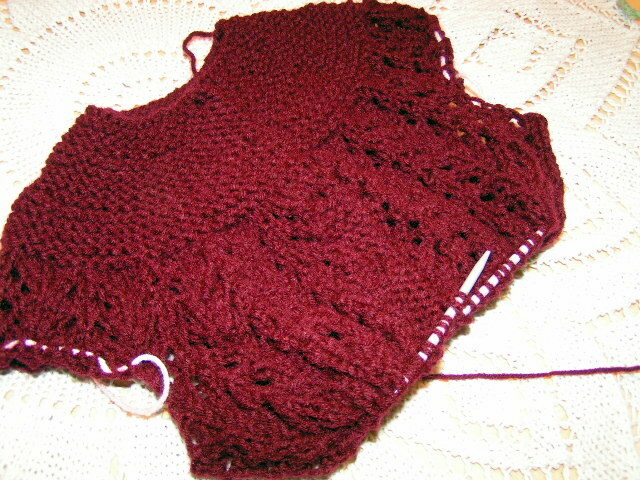 I worked K2P2 ribbing for 4 rows then started adding a pair of shortrows every 2 rows of ribbing. When I had worked 16 rows (not including shortrows) I bound off. Finishing. 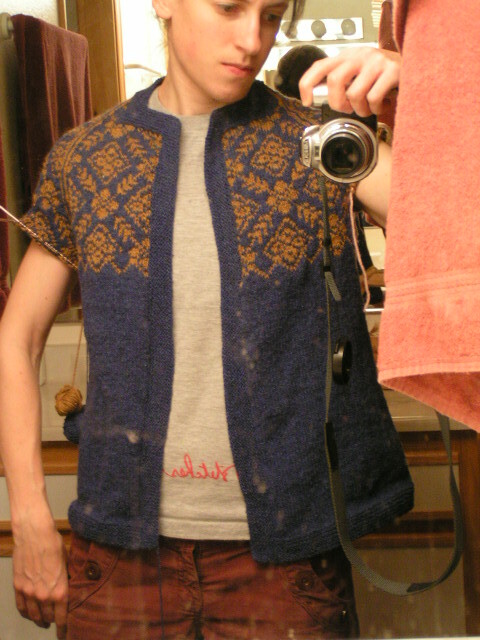 I sewed the edges of the collar one over the other and down to the 10 bound-off stitches. The steeks were already faced so I just had to sew down the crochet stitches to the inside of the sweater and everything was tidy and contained. Noro. Sock. Does it get any better? The Adventure Sweater is done!!!!! Thank Heavens because the birthday party is at 10am tomorrow! It came out fantastic. I’m sorry I can’t show you here, I still haven’t bought more WordPress upload space. But there are tons of pictures up on Flickr and a few on Ravelry as well. The main thing about this sweater was integration. The pockets, zipper band and facings, hood, drawstring casing… all integrated into the design. 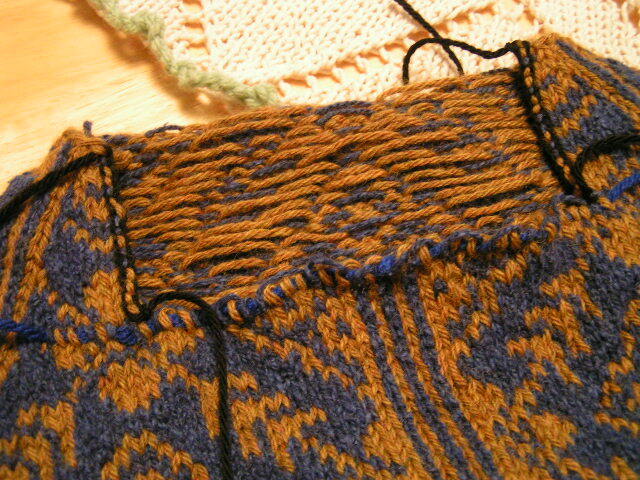 Along with knitting seamlessly a la Elizabeth Zimmermann, the integrations really minimized the finishing required. Yes, there was some sewing involved, but it was much less than I expected. Recipient- Andree We met him and his family through Nikolai’s preschool. He was adopted from the Ukraine in February and has become one of Nikolai’s favorite playmates. So why do I call this the Adventure Sweater? I wanted it to be a perfect utilitarian kid’s garment. Shortened sleeves so they don’t get dirty as easily. Pockets for storing treasures. Zipper for ease of dressing. Hood with drawstring for windy days. Loose fit for cozyness and growing room. Name tag that doubles as a loop for hanging, because what little kid doesn’t like seeing their own name? The sweater ended up being all of these things, but it was also an Adventure for me to make. I’d never tried pockets before. Never tried a zipper before. Never tried a hood before. And steeks are always an adventure! Go check it out on Flickr! And maybe tomorrow on Zimmermania.